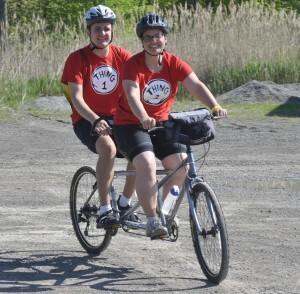 This year’s Evan’s Ride for Autism was a huge success, raising well over $15,000 for Autism Ontario- Niagara chapter. 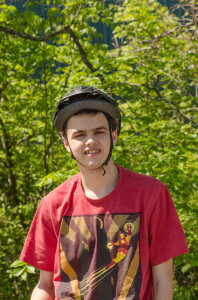 Evan enjoys the ride on Sunday, in support of Autism Ontario – Niagara chapter. “The ride was fantastic. The weather was perfect and tons of fun was had by all,” said event organizer and Evan’s father Len Sheldrake. You can still pledge online at http://www.autismontario.com. This year’s event was such a success thanks to the great community support, he added. Kathy Smith and her son Carter rode tandem while they participated in Evan’s Ride for Autism on Sunday morning in Smithville. This year, virtually every business in Smithville was involved in some way. Again this year, Biggs and Barr from 97.7 HTZ FM were there to host. The event had over 70 participants. Len and Evan would like to thank everyone who participated and sponsored the event, making it the most successful ride yet.